So, this arrived today. With it came a sense of relief, of happiness in finally being officially settled into this decision. After months of talking the talk, we’re now on the books. Which means, of course, we have to walk the walk. We’ve been blessed to have so many of my friends and family members who are supportive and understanding. But, I’m also certain that the old rule that Thumper reminded us of “if you can’t say anything nice, don’t say anything at all” is being played out and I know that there are probably more than a couple of friends who see my statuses on facebook or read this blog and roll their eyes or wag their fingers with questions and concerns over our decision. Don’t your children need socialization? What about the core curriculum? You’re not a teacher! Isn’t it nice for kids to get affirmation and guidance from people other than their parents? Have you never MET a homeschooled kid? They’re weird! Are you a religious nut job? What’s next? A commune? A chicken coop? You have no idea what you’re doing and your kids are going to pay the price. And, truth be told, some of the thoughts are my own. I need to remind myself of our reasons for choosing this path, and to lay out for myself (and perhaps also for the finger-waggers and silent head-shakers who may or may not think I’m willfully choosing to raise illiterate, anti-social, Unibombers) what we hope to accomplish throughout this coming school year. For starters, we aren’t choosing to homeschool because we want to be different. We aren’t doing it to start a trend or to become known as “that family who homeschools.” Far, far from it. We just felt that for this moment in our family, this is the most organic and natural option for us. In every way that the mad dash to the bus stop and losing my children for eight hours a day, five days a week, was NOT organic for us – we are hopeful that homeschool WILL be. Rather than drawing pictures on the backs of their completed school work (while waiting for the rest of their class to catch up), we want our children to be free to explore their own interests and take on self-directed challenges and studies as they feel led. We hope that learning together as a family will give us the freedom to pursue family interests as well. I love the idea of field trips as a whole family, perhaps with our other friends or groups who homeschool as well. A weekday at a museum with my kids. A trip to a working farm. Sturbridge Village. Plymouth Plantation. Boston. DC. Why? Why not. For us, homeschooling isn’t about closing ourselves in, it’s about letting us all OUT. I am also hopeful that as we settle into this new year, we can incorporate family community service projects into our weekly schedule and that we can spend more time together, learning how to reach out to others. And yes, it’s about curriculum and core learning. And no, I am not, nor have I ever been (or wanted to be) a teacher. But considering the shrug and I don’t even know all of the words your son is learning for his vocabulary lessons! and I have to try and make up more difficult problems for him at math time because he gets bored, comments from our son’s (very well-meaning, all around lovely teacher,) it seems to me that so long as I have the materials present, we can fumble through and learn together. Because kids are social. Heck, I’M social. But, honestly, public school isn’t about being happily socialized, it’s little more than forced association. Here, you’re from the same block, be friends. Wait. I seem to recall at least one or two (possibly even myself among them) people who didn’t quite fit in, even in public school. I actually seem to recall that there may have been even a few socially awkward kids in my public schooling experience. No homeschool involved. Just naturally weird. This isn’t 1989 or even 1996. This is 2013 and this is a growing movement with very normalized, not weird at all, well educated and critically thinking individuals, rising up from it. For us, it’s a matter of choosing what programs to enroll in, which friends to reach out to (which we have, and I’m very excited to tackle this year with them) and how busy we want our first year’s schedule to be. But. Yes. I did just scroll back to the top of this post and glimpsed again at that letter. And yes, my eyes then glanced over to the now very full bookshelf of educational materials and curriculum. And yes, I am scared. But not any more frightened than I am at the prospect of not taking this opportunity as it has been given to me. Sort of like when I first saw that positive pregnancy test for Alex. Months and months of wondering what it would be like, to be pregnant, to be a mother, and then, boom. There I was. childhood, homeschool, homeschooling, motherhood, parenting, socialization, what am I doing? 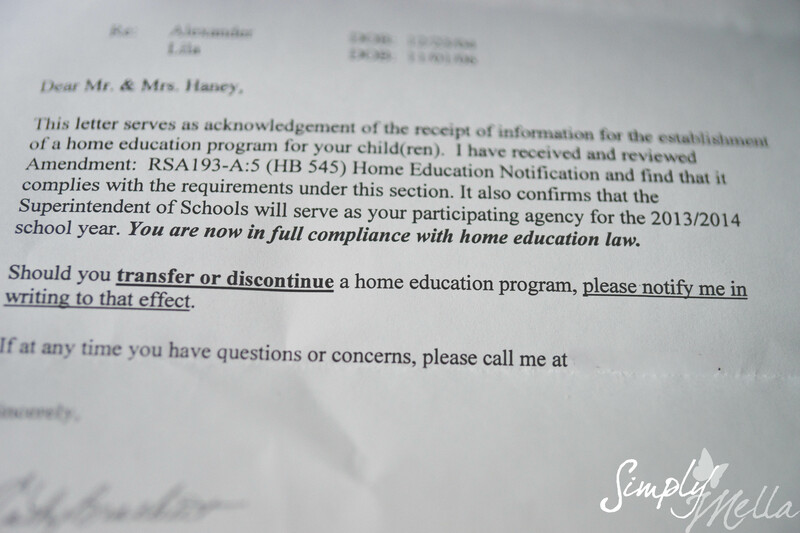 Our kids have been in school, are now being homeschooled, and one of them will probably re-enter for high school. Homeschooling is one of the best choices we have ever made, and we are part of a giant, diverse homeschooling community. Far from being anti-social, my sons are rich with friends of all ages and both genders. And I have a fierce, funny, wickedly smart group of grown ups to look to when I need help on our journey. We are now starting our second year of homeschooling. We have brought back a love of learning, which he had lost while in public school. Just after one year, we can definitely see a difference…for the better! I think this year will be easier, since both my son and I have a better idea of what to expect. That’s so encouraging to hear, thank you for commenting! We just got our letter in the mail too! The funny thing is, it arrived at the same time as the letter from Clara’s would-be 1st grade teacher welcoming her to the class… Oh well… I guess they’ll tell her eventually. After reading your post I think you will ace the homeschooling thing. I’m nearing the end of a great homeschooling run with my two younger daughters. The older is off to college (with a very nice merit scholarship) this weekend and the younger is spending the year living and going to school in Turkey as a Rotary Exchange Student. Socialization has never been an issue! Deep learning in topics they loved has paid off nicely. Wishing you all the best on this most amazing adventure. I’m a finger-wagger and a “ask all the questions” gal…but if I’m being honest it’s because I don’t have the gumption to take something like this on myself. I think I am far more comfortable with the idea of having someone else to blame for a poor education than the idea of having to blame myself and be the one to let my kids down. I’m also not in a position to do this. I don’t have nearly enough money to stay home with the kids during the day. There are times I wish I did. I guess I will say this – I’m skeptical of the undertaking but will no longer wag fingers. I’m excited for you and your family and honestly, genuinely wish you the best!